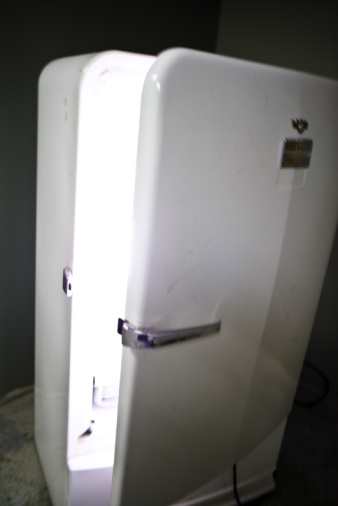 If your refrigerator is working properly, it should be cold inside and there should be warmth behind or underneath it. The warmth is coming from the compressor, and it's normal. However, the warmth shouldn't be excessive. That indicates a possible problem with the compressor, and if so, you'll probably notice the temperature inside the refrigerator going up. The main problems associated with compressor overheating are lack of lubrication in the compressor and degradation of the refrigerant. It takes a certified refrigerant technician to handle these problems. The cooling inside a refrigerator or freezer compartment is a result of the evaporation of a refrigerant inside a system of coils. Evaporation is an endothermic process, which means it draws heat from the surroundings. For this evaporation to happen, the refrigerant has to be pressurized in its liquid form so it will evaporate when it passes through a tiny aperture in the coil system. The job of the compressor is to create and maintain this pressure. It's common for compressors to work by reciprocating action. A piston cycles back and forth, pumping refrigerant into the coil on the forward stroke, and a valve prevents the refrigerant from flowing backwards when the piston retracts. The cyclical action of the piston (or gear system in other types of compressors) generates heat, so the compressor needs a steady supply of lubricant to prevent overheating. The bulk of the heat is generated at the compressor discharge port. It's normal for this temperature to be as high as 300 degrees Fahrenheit, but it should never be higher. If the temperature rises to 320 degrees, the refrigerant will start to break down. If it gets hotter than 350 degrees, the lubricating oil inside the compressor will start degrading. It's difficult to measure the temperature inside the compressor, but you can get a fairly accurate idea by measuring the temperature of the discharge line about 6 inches away from the compressor. The temperature of the tubing at this distance is typically 50 to 75 degrees lower than inside the compressor. The safe range for this temperature is below 225 degrees. It's fairly easy to measure the temperature of the compressor yourself. Pull the refrigerator away from the wall and locate the compressor, which is usually near the floor. The discharge tube is the warm one; the other one contains vapor and should feel cool. Unplug the refrigerator, immediately place a thermometer on the tube and record the reading. If the temperature of the tube is higher than it's supposed to be, the cause may be poor ventilation. Try pulling refrigerator a little farther from the wall, letting it run and checking the temperature again in 24 hours. It's also possible the compressor is too dirty. Dust and debris interfere with air circulation and amplify the heat generated by the compressor. Unplug the refrigerator and remove dust with a vacuum, a rag or a compressed air blower. If the refrigerator continues to run hot after you have tried these remedies, it's time to call a service technician. Servicing the refrigeration system, including the compressor, requires a license, so it isn't something you can do yourself.